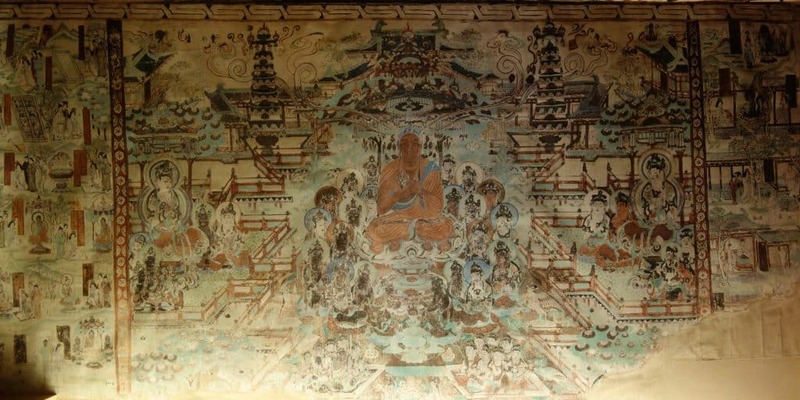 The Mogao Caves house some of the finest Buddhist art in the world. Some were dug out more than two thousand years ago. The digging of masterly decorated caves continued for more than a thousand years. With Dunhuang being an outpost on the Silk Road, this is where local merchants prayed before undertaking the grueling desert crossing. You will get a guide upon visiting the caves. Your guide will unlock several of them for you, giving you a good example of the different styles of art. In the end, make sure to go into the two caves that house the lying Buddha and the giant standing Buddha. Crescent Lake is an oasis in the middle of the desert. Located in between sand dunes, the lake has the shape of a crescent moon. Next to it, you will find a beautiful pagoda. The site is best viewed from the top of a sand dune. Climb the ladders in the sand to make it to the top, enjoy the view and then run and jump back down again. Crescent Lake also gives you the opportunity to participate in several fun activities. We rode camels, which was a lot of fun. In the evening, we then decided to fly in the motorised gliders that had been soaring above our heads all afternoon. We managed to time it right for sunset and had an amazing view from up there. 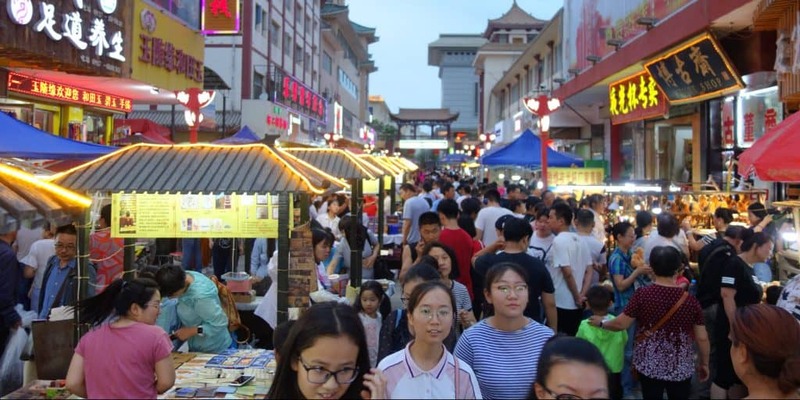 If you’re looking to buy a souvenir, go out to the night market. You will find a huge selection of souvenirs and art. This is also where I recommend you go for dinner. Located inside a giant hall, tiny restaurants fight for your attention. While many of them offer the same dishes, it pays off to look around before choosing one. Some menus vary, some are more popular with locals. We had some delicious noodles towards the back of the market. 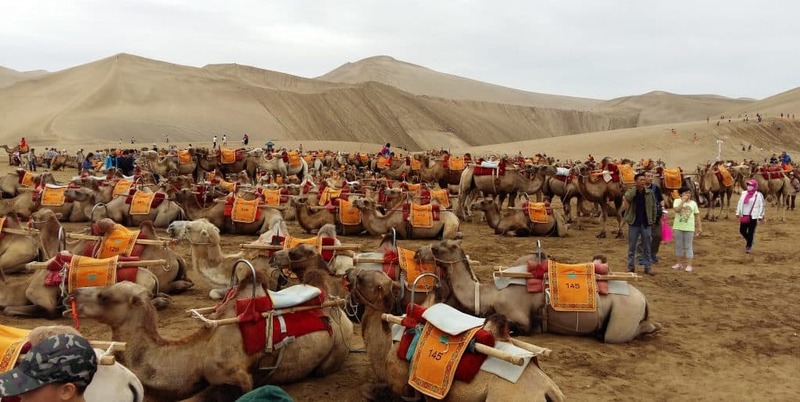 The Dunhuang museum houses great exhibits teaching you about Dunhuang’s past as an important Silk Road city. 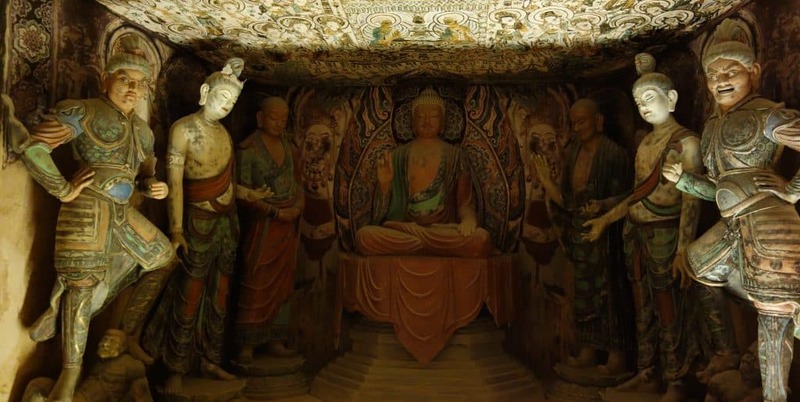 This is also where you will find more information on the Mogao Caves. Since you’re not allowed to take pictures inside the real cave, the one they reconstructed in the museum is your chance of snapping a photograph of this outstanding Buddhist art. Entrance is free but you must bring your passport to get inside. 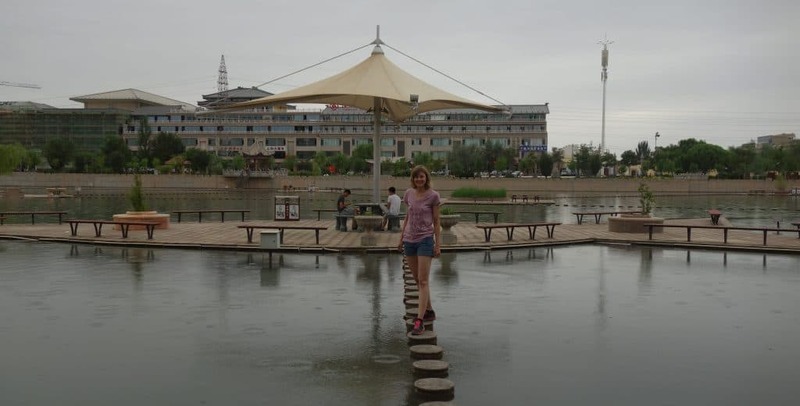 Platform Park is located in the middle of the river that flows through Dunhuang. It consists of several bridges and platforms connecting both sides of the river. The easier pathways are narrow bridges across the river while the more advanced ones consist of stepping stones. Be careful not to fall into the water!